Kelly Bienhoff, MA, is a Media Relations Officer on the Marketing and Communications team. In this role, Kelly works with journalists from a wide range of media outlets to help translate IHME research findings into compelling stories for a variety of audiences. Kelly joined IHME in 2014 as a project officer supporting the Global Burden of Disease (GBD) Study. Her role later expanded to support the Director’s Office and the Network Engagement Team. Over the past two years she helped facilitate the GBD-wide effort to produce state-level estimates in India, which required extensive cross-team project management and critical relationship management with key partners in India. Kelly previously worked for four years in Boston on a project to train physicians, lawyers, and police officers in Central Africa on the investigation of mass crimes. 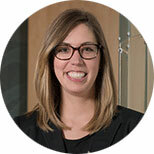 Kelly earned her MA in International Human Rights from the University of Denver and BA in political science, international studies, and Spanish from Saint Louis University.